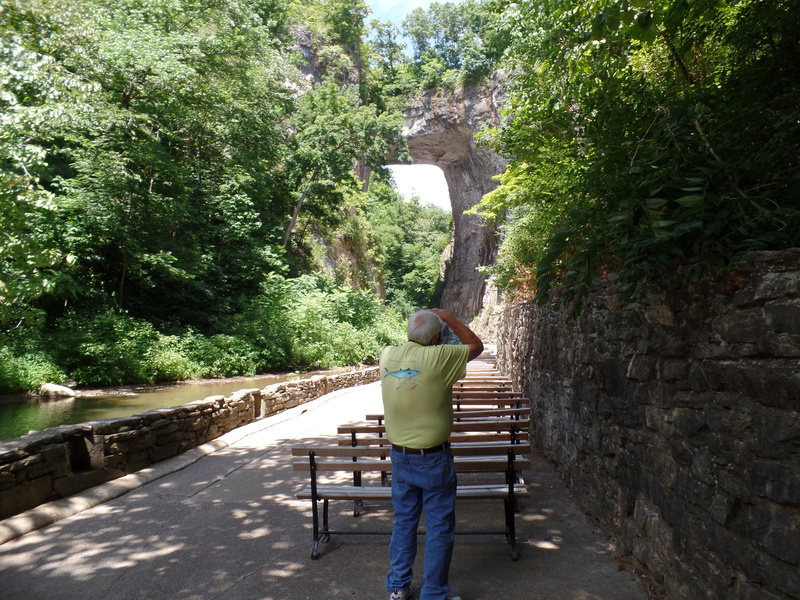 Natural Bridge, VA – Let's Go RVing! Today started off slowly enough. In fact since I really didn’t sleep well last night I slept a bit later today, after 7:00 and then slowly drank coffee and woke up. Jerry had been up a long time but was pretty quiet. Theresa called a little after 8:00 and brought me up to date on what has been happening in her life and I shared the bad news about the river house. We left about 10:30 to go to Natural Bridge with Jerry complaining that we should have started earlier. I disagreed with him as I am really enjoying this pace of life and the “we’ll go when we’re ready feeling”. On the way we discussed the “what if” – what if we were to ever buy another motor home and what would we want in in. Besides the five things already on our list such as 22″ tires, fireplace, walk around bed, split bath and yep – one more thing that I can never think of – Jerry wants a bigger shower. I don’t have any problem in it but apparently he does, more than I thought. I would like an inverter so we can cook as we travel on the road. Of course we both decided that at this point a diesel was still out of the question. We did also discover today that Gypsy, our infallible GPS is indeed fallible! We missed the turn to the Natural Bridge Museum and boy did we go on an adventure. We turned on a small paved road to the left and immediately wondered if we were headed in the right direction but we soldiered on. 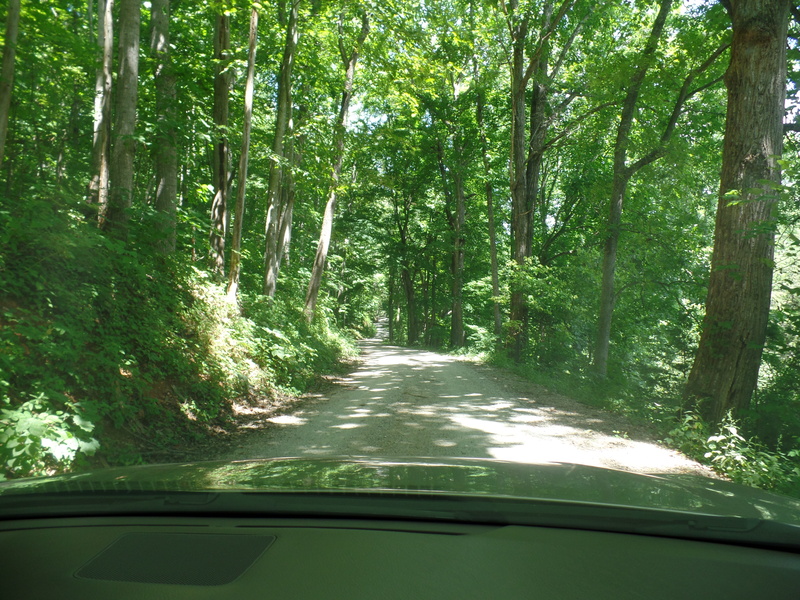 The road got more narrow and was heavily wooded on one side, even the side that had a steep drop-off. This looks pretty and not nearly as formidable as it really was! Then the road turned to gravel. Gypsy kept telling us to go on so we did amid many giggles and uproarious laughter to the point that I had tears running down my face. Suddenly then what should appear but a nice big truck. He very kindly pulled over as much as possible and we continued on down the dusty, gravel road. We finally admitted defeat still amid much laughter and found a place to turn around. We started retracing our tracks and suddenly were face to face with another truck that had been going A LOT faster. We got by and then met another truck. There was no passing but the guy nicely backed up until he could pull over so we could get by. I suggested Jerry ask him for directions but Jerry forcefully declined and said he was getting out of there. We finally saw civilization again and quickly got to the museum. Then we sat in the car and ate the sandwiches we had prepared earlier. We decided before our trip began that we wouldn’t eat out very much and so far we have stuck to it. We’ve fixed a picnic lunch every day and had good dinners in the evening. I’m sure we’ll be eating out next week at the horse show. We wandered through a large gift shop that featured a lot of butterfly themed trinkets from stained glass to other knickknacks. We later learned that there is a butterfly garden there but unfortunately we didn’t see it. We bought the tickets and then headed down the 137 steps to the beginning of the hike to the Natural Bridge. It was a little steep but an easy walk. We reached the small cafe and the guide sent us on our way. We very quickly reached the Natural Bridge and I wish I could adequately describe it. I will say that it is the most spectacular thing that I have ever seen other than the Grand Canyon. To think that nature created it is absolutely amazing. We hiked on and reached the Monacan Indian Village. It was interesting to see how they lived and I took several pictures. We hiked on to the Saltpeter Mine. Don’t really know what is was other than the entrance to a cave that was chained off. So we took off for the water fall. We made it but it was a bit disappointing… After seeing the Crabtree Falls on Monday this paled in comparison. Then we had a 3/4 hike back to the cafe. At times it was cool with a slight breeze and at times it was just plain hot. Although I didn’t sleep well last night but think I will tonight! We took the shuttle back to the gift shop rather than climb the 137 steps back up. We went in the gift shop and I talked Jerry into buying a t-shirt. Our next stop was the Natural Bridge Caverns. The temperature in the cavern is a steady 54 degrees so I grabbed my State jacket that I keep in the car. It felt really good going in but by the end of the 3/4 mile walk I was ready to take it off. The cavern descend 34 stories the last part not recommended for those with breathing or heart problems because of the change in pressure. When we got to the end the guide wanted us to see how dark dark is. Having visited the Luray Caverns some years ago I was somewhat prepared for this although not looking forward to it. When we visited the Luray Caverns we walked into a pretty narrow crevice and were lined up in there. Unfortunately Jerry and I were at the head of the line in Luray Caverns meaning we were the deepest in the crevice. Talk about claustrophobia! When they turned the lights off Jerry had to keep telling me to breathe and it’d be alright. This was nothing like that. In fact when he first turned off the lights several cell phones or cameras still showed some light however when they were turned off it really was dark, so dark that one could not see your hand in front of your face. We hiked back up to the top, a lot of steps and I was no longer cold when we got there. We headed back to the campsite but made a couple of stops along the way. We had planned to wash clothes and the laundromat instructions were to only use liquid soap so we made a stop at Target to get some. We had also decided that we wished we had bought the bowl we saw and liked at Monticello so back to Monticello we went. Jerry dropped me off at the front of the gift shop and it took me less than 5 minutes to get the bowl, get it wrapped and get back outside – then Jerry had to find me. All of the streets led out and not in but eventually we met. On the way back to the campground we decided that since it was getting so late, nearly 6:00, and we hadn’t had dinner we’d wait to wash clothes. We came on in and immediately started getting dinner started. This was my first time using the convection oven and I didn’t quite know what I was doing. We were having a meatloaf that I had prepared at home. The instructions for a regular oven say cook it 45 minutes but I thought it took less time in the convection oven. Having heard about the bottom of things burning I cooked it 30 minutes, checked it and cooked it 10 more. Actually I think 45 would have been perfect. I warmed up the stewed potatoes and peas we had on Monday night and sliced some cucumbers and tomatoes. After cleaning up the kitchen I went outside to read hoping for a visit from Robert. His RV was closed up tight and I never saw him. Jerry joined me and we read for a while and then I began typing the day’s activities. Since I didn’t get much sleep last night I went on to bed. Jerry came in about 10 and by 10:15 I think we were both sound asleep. It was a very good day and I think Jerry’s favorite. It was certainly the most fun day. We laughed until we cried. I don’t know what the future holds for us as we transition into Jerry’s retirement but right now we are having so much fun together. What a blessing. Thank you Lord!